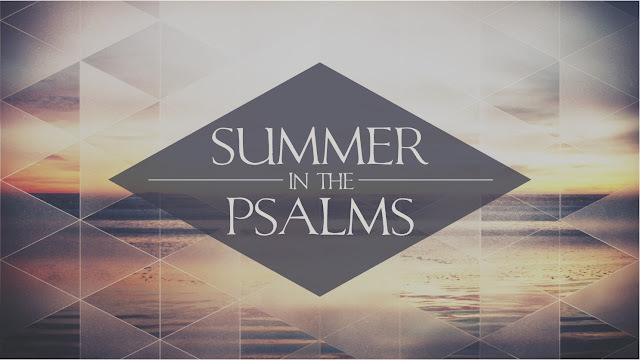 This summer our church is going through some of the Psalms. We've been looking at the Psalms to help us define who our church will be in the community of Ventura. Yesterday I preached on Psalm 8. In verses 2-4 we read about man's littleness and the greatness of God. Honestly it seems like a huge leap to jump from the heavens to infants but thats what David’s getting at here; the majesty of God is seen in both! If you’re a parent you have probably marveled at the glory of God in your tiny infant. Think about holding your child when she was young. Think about counting her little toes or admiring her little nose. Think about how soft and delicate the skin of an infant is. God created all the heavens and that tiny baby you once held. You might remember Jesus actually quoted this Psalm to the Pharisees. We are told children were praising Jesus in the Temple courts; shouting Hosanna and the Pharisees became angry He would accept such praise (Matthew 21:16). At this point Jesus reminds them of Psalm 8:2. Of course this would have been quite a rebuke to the Pharisees because they would have been the enemies of God who are being silenced by the praise of mere infants, or children in this case. It was the children praising Jesus, not the religious leaders. It was further reason to put a stop to what Jesus was doing. As we study these next couple verses I need to put some context here. Most scholars think David wrote this Psalm later in his life, but imagine David gathering the material for this Psalm as a young boy. Imagine David roaming the desert all day with his flock of sheep. David would have spent many hot days in the Israeli desert tending to his flock. As night approaches he fights his sleepy eyes from closing because he knows the show is about to start. Laying in the middle of the desert, all alone, in the crisp spring air as the black sky begins to sparkle with tiny white stars far above. This night David can see the small sliver of the crescent moon off in the night sky. As David lies there he is filled with emotion. He is exhausted from tending sheep all day, but thrilled with the glory of creation. He knows he should go to sleep but he examines the stars as they wander through the night sky and watches as the planets slowly become visible. The majesty of God keeps David awake long into the night as he thinks about how God placed every star in place. David looked forward to those uneventful nights where he lay under the stars contemplating the work of God. Have you experienced a time like this? A time where you were outside at night and looking at the majesty of God? Maybe it was on a camping trip when you were younger or maybe you grew up in a place far from the city where the stars seemed to jump out in the night sky. It must have been different for David because now we have all the light pollution. With the increase of population and electric lights we miss the full beauty of the night sky. Even though we might not see every star, the Bible tell us that God has given each star it’s own name (Psalm 147:4). This Psalm has been called the overview of creation. As we continue going through it you’re going to see that more. God spent six days taking what was formless and void, turning it into the spectacular world around us. God took dirt, air, space and matter turning a hostile living environment into a place perfect to sustain life. After finishing His handiwork God looked around and noticed something was missing. It seemed God was finished but in reality, after six days of work, He was just getting started. In all the beauty of creation God knew it wasn’t complete; man was a special order in creation; the only thing made in the very image of the creator (Genesis 1:27). David continues the Psalm by asking God one question in two parts. The littleness and greatness of man are set before us here in powerful contrast. Psalm 8:4 gives us the earthly side of human life and the divine side. The earthly side is that our lives are like a speck. Our life is but a vapor on this earth. Compare the life of a human with the life of a giant redwood tree. We are frail and subject to the harsh conditions of this world. This about this life. We spend about one-third of it in sleep. We spend time shopping and finding food to eat. Then think about our knowledge. We understand a small percent of what is out there. We may study the sciences but know little about mathematics. One might study economics but little about construction. When the library of Congress was founded in 1800 it began with 6,487 books. Today it has accumulated more than 16 million books. The second part reminds us that God is mindful of us, that God cares for us. Some people think that God doesn’t care for them, that they are all alone here on earth. There are thousands of lonely people living right in our community who are wondering if God is mindful of them, if God cares for them. One very tangible way we can see how God cares for us is that He didn’t leave us alone. As Jesus was preparing for His death and resurrection He told his disciples that He would leave us the Holy Spirit to teach us and remind us. The Holy Spirit will be our comforter in times of need. What a great reminder that God cares for us. Now there are times it can feel like God doesn’t care for us but let’s avoid pessimism. It might feel like God doesn’t care for us, but that is not the truth. The truth is God deeply cares for each of us! Let’s trust in God’s caring nature for His children. Therefore, people direct more evening online.